Deadline for entries is April 12th, 2019. You may submit images by giving us a link (if you don't have your own webspace, Dropbox and Imgur are image hosts). You can also send us a CD or USB drive. by mail on a CD or USB drive. 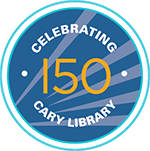 Please check below to indicate that you have read the Cary Memorial Library Art Exhibit Policy and Procedures and agree to follow them.